A concise annual overview of motoring in South Africa, for the motoring enthusiast, to showcase the spectrum of motoring events & to provide the enthusiast with relevant information. A useable tool in the workplace, a useful tool to plan your motoring event participation. Motorheads Diary 2015 is an A5 size, hard-cover diary which is designed to appeal to a wide spectrum of people - from National & Regional Racing & Rally drivers, to Street Rods & Classic Car owners, bikers, & every other kind of motoring enthusiast. It is designed as both a useable diary, which one would carry in a briefcase and use in the office, while being choc-a-bloc with information and entertainment for the South African motoring enthusiasts The book features historical motoring-related facts, as well as a calendar of motoring events - races, rallies, shows & biking events. Significant international events are also included. Profiles & short articles featuring a cross-section of both well-known & lesser-known car people & clubs provide additional interest. 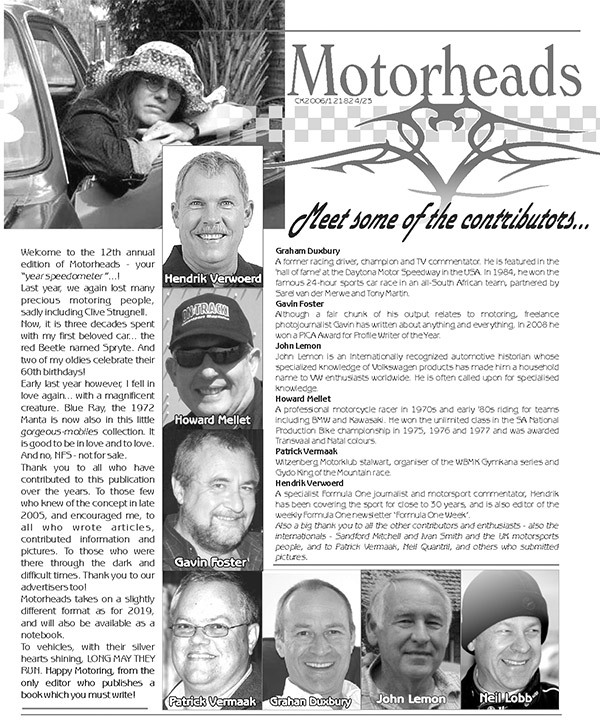 There are also articles included by Motorcycling personality extraordinaire Clive Strugnell, motoring journalist Gavin Foster, VW Historian John Lemon, Witzenberg Motorklub stalwart Patrick Vermaak, Formula One specialist Hendrik Verwoerd, as well as other well known motoring journalists. As always, there is an inspirational foreword by racing champion Neil Lobb. The beauty of the diary is that it will be something you use throughout your working week, whatever your occupation, in the way you'd use a conventional diary, jotting down appointments, telephone numbers and work schedules. At the same time it provides all the information you need to fuel your passion for motoring throughout the week. This diary is a must-have for the motoring enthusiast!